FEW Collingwood players have been so intrinsically linked to one individual game as Mark McGough will forever be to his 2002 Anzac Day performance. McGough may have played 37 games for the Magpies across three seasons – and a further 12 for St Kilda – but when anyone thinks of the chunky young footballer with the shuffling gait and uncanny knack of finding the football, it always comes back to his second AFL game. He was only 17 and a student at Northcote High School at the time. Given his age, he was still a few months off having his driver’s licence, and had to hitch a lift to the Anzac Day clash with his teammate Anthony Rocca. Yet by the end of the game, Collingwood had not only emerged victorious against Essendon on a wet and wild Anzac Day, but McGough stood head and shoulders above the pack. He had 24 disposals, revelled in the conditions, and was adjudged the Anzac Medallist in front of 84,894 fans. Five days earlier, on debut, McGough had received two Brownlow votes, for his two-goal 22-disposal effort against Hawthorn. He got the full three votes on Anzac Day, making him one of those rare footballers to poll Brownlow Medal votes in each of his first two matches. Few people saw that start to his career coming, even those who had recruited him the previous November, when drafted with Collingwood’s third pick – and 43rd overall – in the 2001 national draft. They knew he wasn’t a new-age athlete-turned-footballer. The kid from Mulwala – or more specifically Bundalong, the tiny town that sits at the junction of the Ovens and Murray Rivers – was a pure in-and-under player. His maturity and strong body helped with his introduction to AFL football, even if his youth meant he had to balance his game around his studies, doing three Year 12 subjects at Northcote High School. He had to do early morning skills sessions at a local park with the club’s development manager of the time, Adrian Fletcher, so he could attend classes. McGough settled in well at Collingwood, and Victoria Park. His form in the reserves was good early in the 2002 season and he won elevation for his first game in Round 4 against Hawthorn – at 17 years and 302 days old. After his first-up performance, as second best on ground to his captain Nathan Buckley, there was never any doubt about him playing on Anzac Day – in the eighth version of the Collingwood-Essendon April 25 clash. He started on the bench and spent most of the first quarter on the pine. Essendon’s Jason Johnson started well, and coach Mick Malthouse needed someone to come on and curb his impact. McGough got the job, and never looked back. The wet conditions suited the teenager, and also the young Collingwood team that included two nineteen year-olds in Alan Didak (seventh game) and Ryan Lonie (25th game), as well as three 20-year-olds in Jason Cloke (fourth game), Leon Davis (38th game) and Josh Fraser (47th game). The Magpies kept the previous year’s Grand Finalists Essendon to only four goals, while kicking nine themselves to win the match by 33 points. It was no surprise when Craig Willis soon after announced McGough had won the Anzac Medal. He got a pat on the back from president Eddie McGuire and coach Mick Malthouse as well as a firm handshake from RSL president Bruce Ruxton when he received his medal. Drenched but delighted, he caught up with his family in the rooms after the game as well as some friends who had driven down from his home town. He said the reality would set in the following day when he had to go back to school, which he duly did after a recovery session. Sadly, it didn’t quite pan out that way for McGough. He played 17 games in his debut season, but was out of the team by the time finals came around. He could muster only eight games the following year, laughing years later that his second Anzac Day game wasn’t as memorable as the first. His third and final Anzac Day clash came in 2004, and he had 29 disposals and kicked two goals, receiving two Brownlow Medal votes in a losing team. It was, however, McGough’s last season with the Magpies with his lack of leg speed counting against him. 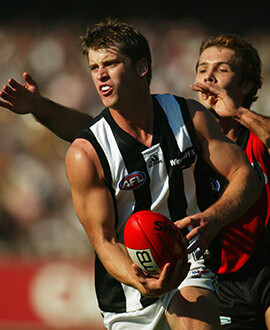 He was delisted at the end of 2004, and played two seasons with St Kilda before his AFL career was over at 22. Still, those who were there that Anzac Day in 2002, or who watched the game from their living rooms, will never forget what the kid in the No.27 jumper was able to do in only his second match.